Mom was having so much fun with this week’s Caturday Art project that I had to make her stop so she could go to bed! She decided she wanted to try a colored pencil sketch this week. She used the colored pencil filter on a duplicate layer. Using luminosity on this layer made the color pop through more from the original layer underneath. Then she thought she would see how the glowing edges filter would effect the outcome. She liked this filter so much she had to do a second version of this photo. This is just the filter on a single layer with the settings manipulated to get the desired look. She was working on a third one when I said enough is enough. It’s late and I’m ready for bed. 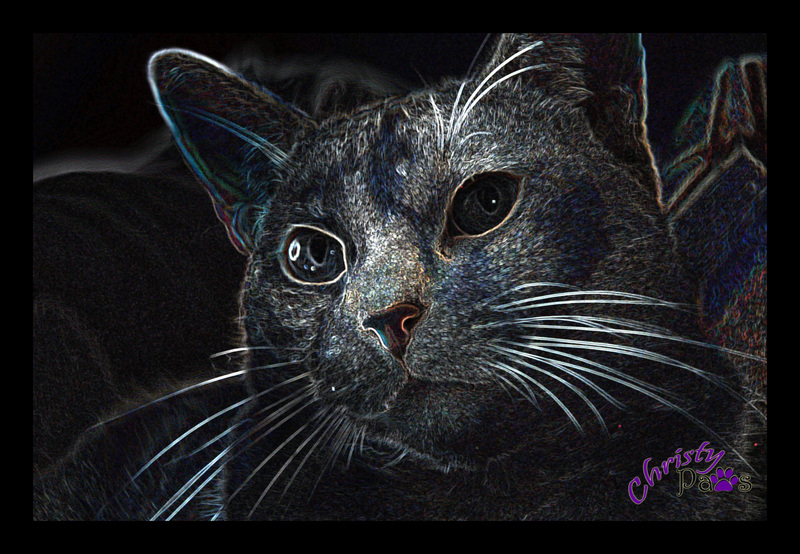 Tagged cat, cat art, cat photos, digital art. Bookmark the permalink. Your mom is so good at making Caturday Art!! Both pictures are just wonderful! Mom says thank you so much! 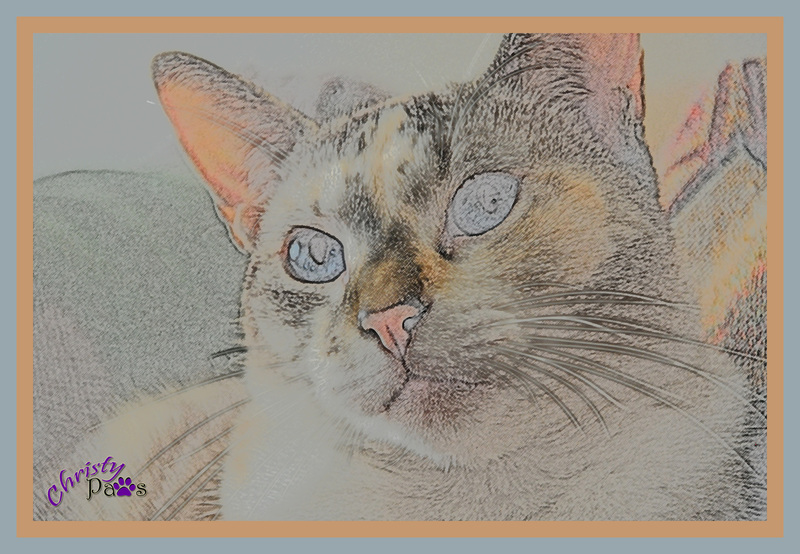 Wow, that is a gorgeous picture of you your Mom started out with and we love the pencil sketch…have a wonderful weekend! Wow! Is your Mommy ever talented! Wes just LOVES Saturdays and seeing all the art that everyone does. 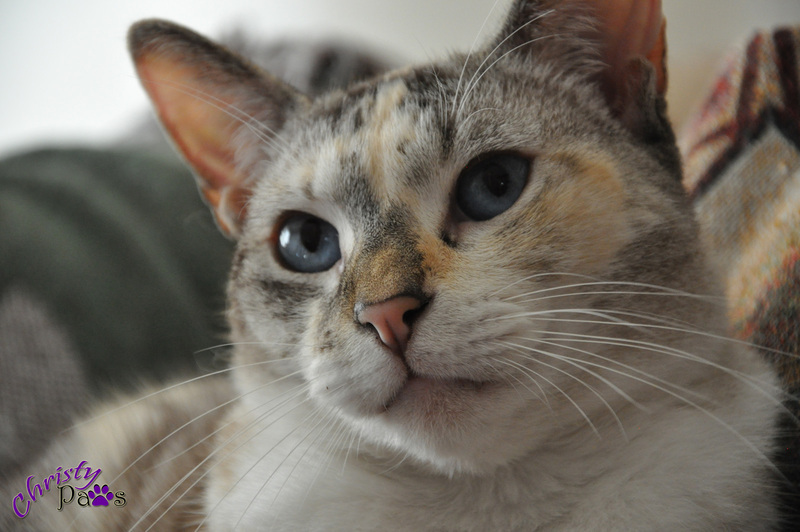 that is catabulous! There is a drawing technique, where you leave the background white and paint black on top…then you take a caligraphy pen and “draw”, that is what this reminds me off. Oh, that sounds interesting. Mom says, if only she had any talent as an artist! Alas, she has to be content with creating in Photoshop! You have a talented Mom. I do prefer the pencil sketch cos your blue eyes really stand out. Very cool! We always like that pencil effect. Wonderful as always! Color pencil is so nice on you! Oh Wow those awe sum gweat fotos. And yous look just stunnin’ in all of ’em. 🙂 Hav a gweat Caturday. You started with a gorgeous photo, so it would be hard to go wrong. The pencil sketch is very cute. I like all the soft colors. The glowing edges effect is striking. I think that’s a very special rendition of you. Thanks. I’m kind of partial to the glowing edges too. WOW, those are both great. Your mom did a great job, and we give it 4 paws up! (Mario picks himself up after he falls over from trying to do 4 paws up! Oh, Mario! Silly boy. Mom thanks you for the compliment! Those are some great pictures. Good for your Mom to know how to do the photoshop stuff. We like the third picture the best. Have a great Saturday. Mom says she is just a Photoshop novice but she sure has fun!